In my heyday I wrote a couple papers on books. Turns out that when you pursue a BA and an MA in English you have to read a little bit and then make sentences about those books and give them to a professor so s/he can tell you how you were using semicolons incorrectly. Then when you finally master the art of the semicolon, you get to put on a robe and play pretend that you’re as ready for life as the people who majored in business. For all the tens of poems and books I’ve read, though, the one that actually exposed me to real life was one that my Mimi read to me in bed when I spent the night with her: Eloise. Apparently there are movies about Eloise now, but I’ve been too busy since 2000 knowing things about Hamlet and Beowulf to bother seeing them, so let’s just talk about the original. Here’s my thesis: Eloise, a six-year-old living at the Plaza Hotel in New York City in the mid-1950s, is more ready for the world than I’ll ever be. I’m probably not supposed to be writing in the first person since this is an academic assessment, but I’ve got the book out open next to me while I’m writing this so any credibility I could have lost is regained by my complete seriousness and commitment to this treatment. First of all, Eloise takes pride in what she can do and therefore breeds confidence in those around her and her scant abilities1. Her marketable skills include but are not limited to: chewing gum, hopping around for a while, braiding her turtle Skipperdee’s ears, standing on her head for the longest amount of time, standing on her toes, getting dizzy and falling down, and making a terrible face. Although she could use her time in perfecting these skills, she has an incredible sense of duty towards the minutiae of the place she calls home. Par example, “Then I have to go down to help the Switchboard Operators in case there are any DAs and there has to be some sort of message taken or something like that.” Just so you know I’m not making this up and taking that one example out of context, here’s another one: “I have to help the busboys and waiters get set up in the Crystal Room [.] They always wait until the last second for Lord’s sake and then we have to rush our feet off.”2 Despite the fact that most of Eloise’s daily tasks are tedious and boring, she does them anyway with a healthy amount of complaining. In contrast, I am way too passive aggressive towards doing the laundry and getting the baby to eat carrots, so I will probably implode. Or just take my frustrations out in blog posts3. Except for Thomas, it’s pretty clear that all of Eloise’s assistants are free agents, and Thomas has a Corvette so he’s clearly doing well enough to overlook the fact that he’s serving The Man5. I admire Eloise and her rumored mother for not supporting the machine by attending a big box nursery school or Fantastic Sam’s. I wish I had the discipline to be such a localvore, but alas, Target exists and I am a married white woman with a child and well you know. Finally, we have reached Point Number Three of my thesis, which if you’re following along on the outline I had to turn in like seven months ago, should either be III, C, 3, or K if ya nasty6. It could actually be a subset of Point Number One but since I need to have a three point thesis we are going to pretend that this one is wholly unique and genius. 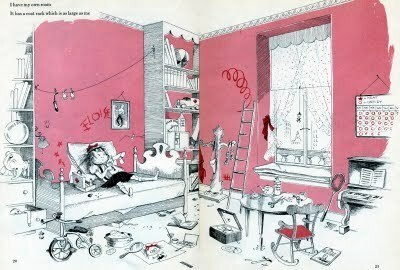 It is this: that Eloise has her priorities straight and serves others at the expense of the tidiness of her living space. She gives absolutely no indication of remorse that her room is a train wreck. Her duties concerning the well-being of her dog Weenie, the aforementioned7 Skipperdee, and her dolls Sabine and Saylor supersede the order of her room. She resists every inclination to worry about her room because to do so would distract her from the pressing needs of those in her care. In contrast, it has taken me close to two weeks to write this blog post because of my currently undiagnosed OCD and its pertinence to the mopping of my kitchen floor. As much as I want to be Mama Emily and provide you all with thought-provoking reading material that powers you through the day, I simply cannot. My life seems to just get in the way. I wish I were more selfless like Eloise. In conclusion, I just wrote an essay about Eloise. I extrapolated points from the book and described how they pertain to my life. I attempted to use correct grammar and I ignored the little jaggedy red lines when I made up words. I did all this because I pay back an ungodly amount of money each month on my student loans and I feel as though I should be putting my skillz to work. I probably didn’t do a very good job of describing how incredibly wonderful Eloise really is. Please don’t fault me for this, though, because it’s hard to comment on perfection without detracting from it. 1Actually, most of the characters who populate the Plaza fear to see her coming but don’t you think that the first point that I wrote sounds good? I do, so I’m not going to change it. Also, I really wanted to make some footnotes, so here you go. 2Should that have been a block quote? 3Sentence fragment. Tsk, tsk; it’s a good thing I know how to use semicolons. Oh wait. 4So maybe not really BUT STILL. 6Why am I making so many early-career Janet Jackson references? 7Strunk and White definitely said to use this word often to indicate that the writer has done her fair share of book lernin. To reward you for reading the footnotes, here is a picture of Eloise and Weenie. Thompson, Kay. Illus. Hilary Knight. Eloise. New York: Simon and Schuster, 1955. *A note on the bibliography: I hope you appreciate all the work I did to kind of put this in MLA format. I probably did it wrong anyway, but make no mistake that effort was made. This is so wonderful!! I love Eloise. As always, you know how to make me laugh, Emily. (I think I laughed nervously when I saw that I’d be reading footnotes – the bane of my academic existence. Ha!) Everything you do is FP worthy, this is no exception. Eloise really is the best person ever. Writing this put me in such a good place. It’s funny, even though she is a six-year-old, to me she has the voice of a 60-something because my grandmother always read this book to me. Good memories! Thanks, Lisa! This made me incredibly happy! That is all. I am oh-so-glad it did! Thanks! You are far kinder than my former professors. MLA makes my eyes bleed… couldn’t you just post an abstract like scientific journals? What is this “science” you speak of? Isn’t that witchcraft or something? 1) Your grad school teachers would be proud. Of their other students. Ooh, burn. 2) I like how you introduce your thesis like some of my freshman comp students—by saying “Here’s my thesis:” and then putting your thesis in bold. Genius. 3) Semicolons are used to make winky-face emoticons. There, now you know. 4) No, that’s not a 100% correct MLA works cited listing, but I’ll tell you the same thing I tell my students: Who cares? I care, Ande. I CARE. You’ve obviously been talking to my students. I’m the dean. Surprised, eh? This is adorable! I haven’t seen MLA in so long. And I love that part about being an English major and trying to pretend you’re as prepared for life as the biz majors. So true. I never read Eloise and now I kind of want to check it out. I watch and own kids movies, and have since before I had a kid.. I’m not afraid of a little kid lit. Well, technically Eloise is a book for adults. It is insanely witty and dry and there are lots of little grownup Easter eggs thrown in that only they will get. It’s kind of like Grease except with no pregnancy scares. LOL. “Like Grease with no pregnancy scares” needs to be the new description on Amazon or something. This is a pretty great paper. As Professor of Nothingwhatsoever 101, I give this an A.
I’m 100% sure that as a Professor of Nothingwhatsoever you could still get a job at my alma mater. Thanks! Are you saying you want to be a cartoon character? This was a very interesting way to express whatever it is you needed to express. I don’t think I’m smart enough to figure out exactly what it was you wanted to say. Life frustrations? Down in a hole days? Whatever it is I hope you got it out. Stop worrying so much about pleasing us and please yourself. Don’t look too much into that. I think I got it all out. Spending a little bit of time with my favorite fictional six-year-old is very cathartic. LOLOLOLOL. I am actually smirking. Emily, This was a fabulous read – you summed up Eloise very well. She is such a charmer. You also summed up *you* very well and you have one again sneakily(1) show-cased your amazing writing and talent. I can’t include footnotes that well in my comments but here is one. (1)not sure if this is a word, but I’ll use it because Eloise would, and wouldn’t mind if I did too. *I* think it is a word. But then again I think awkwardish is a word. Oh well, I am technically a “master” so what I say goes. Thank you for your kind words. I had a ton of fun with this one. 1. As an expert in all things Eloise (*ahem*), I agree that Eloise puts the needs of all over her own needs but finds it exhausting. This is a lesson all children should understand of their parents. 2. Her mom kinda makes an appearance in Eloise in Paris via telegram. 3. Nanny is the perfect mostly companion because she both indulges and supports Eloise unconditionally. In Eloise takes a Bawth, for instance, Eloise pretty much floods the Plaza, threatening the upcoming ball. Except, of course, that the water turns it into the event of the season and Nanny and Eloise are unmoved by the events. That’s the kind of gal you need on your side. 4. Eloise in Moscow is hard to read aloud, as I mentioned to you on FB. 5. 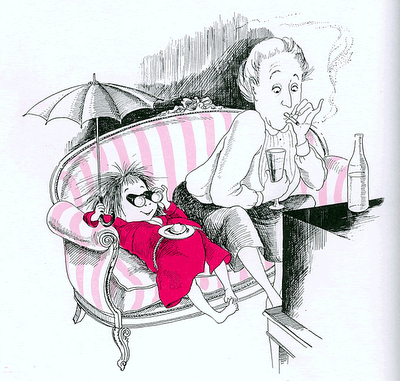 Eloise at Christmastime has layers upon layers of poetry and jokes. It’s now our go-to for Christmas eve. And Wednesdays. 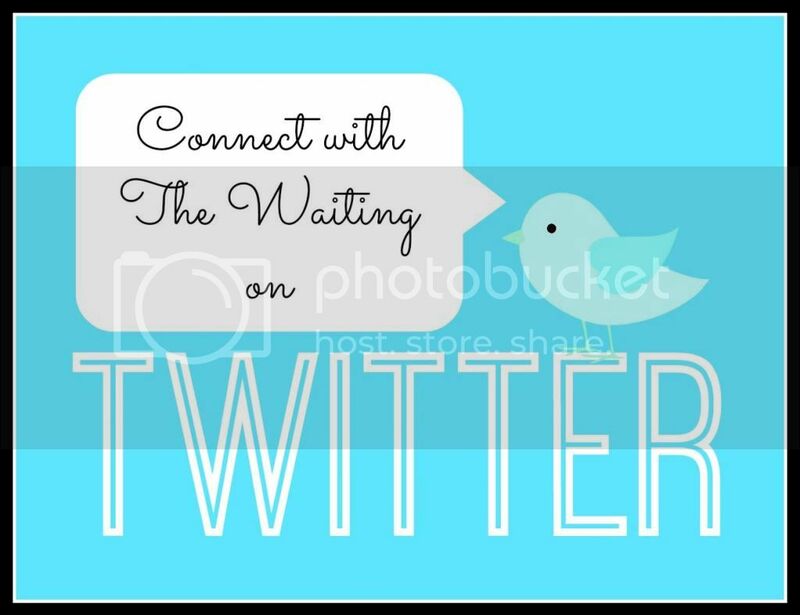 PS – excellent blog topic to explore – it’s obvs. a topic in which we both share an interest. And it’s also one that makes me want to make a proper point in sentences that do not end in a preposition. I know, right? 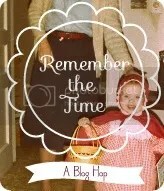 I have been wanting to do a bloggish thing for awhile that incorporates the insane amount of academic writing I did back in the day with something silly. This just kind of worked. It’s so much better to write something seriously about something non-serious. I did my best artwork or writing about my dogs instead of the prompts by professors. This was before, kids, of course. Did you read the books when you were growing up or just when you had kids? 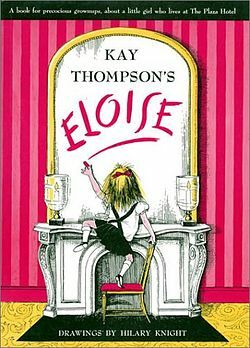 As I child, I think the reason why I took to Eloise so much was because the book clearly isn’t just for kids. It is so chock full of jokes that a kid may not necessarily get but is nonetheless aware of. It didn’t talk down to me or try to teach me something. I loved that she was the only juvenile character in the whole thing and that she inhabited this world of adults. The only person who really has complete patience in her is Nanny, and everyone else’s exasperation with her was really realistic but comical. It is so perfect. I didn’t read them as a kid, but we got Eloise and Eloise in Paris for my baby shower. I even understood that the books weren’t meant for children originally? There’s drinking and smoking in them, but maybe that was just the 50s. I love reading them for the chance to use my performance poetry background. Lots of room for expression, as is wont with reading to children. Somehow I have never, NEVER read Eloise. I knew I was a mistreated child. And that travels through generations. Since I never read it as a child I don’t know if any of my own kids did either. In light of my pitiful situation, your review meant more to me than you know. Also I think it’s time for you to go to New York or at least Raleigh and stay in a luxurious hotel, replete with servants to pamper you. I could not agree more. I need more luxurious hotels in my life. Considering how impressed I am with the Hampton Inn every time we stay there, I’d probably get a case of the vapors if I ever stayed at a classy joint. You really must check out Eloise from the library. You definitely don’t need to be a child to appreciate it; in fact, I think it was originally published for adults. I’m quite certain that Strunk & White had wardrobe malfunctions, truth be told. I do believe that majoring in English and Psych are really not that terribly far apart. That’s probably why we likely share the same credentials after our names, come to think of it. 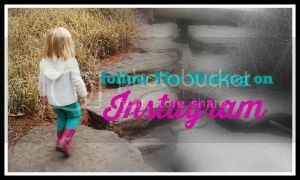 I nominate Eloise to babysit our kids…Fab post, Mrs. Em. Utterly fabulous. Wish the Plaza were still alive to see it! Eloise would be a great babysitter. She would instill an excellent work ethic into our offspring and reward their efforts with broken mints. Very much appreciated and enjoyed this post. Thank you for your top-notch contributions to the world! Very scholarly and well written. You misused a semicolon. See me after class about the snarkiness. I’m already seeing Ande after class. Would you care to combine your wrist-slapping session with his? I think semicolons should be reserved for professionals and people who teach English. You qualify on both counts, right? I think I technically do, but that doesn’t bode well for the institution of English. God save us all. The footnotes are great and the last picture is so cute! Thanks! The real meat is always in the footnotes. That’s where all my best stuff lives. Love it! You English majors clearly have a lot more fun with your papers than us business majors. I just found out about this guest-blogging-thingy on Ninja Mom called “Character Assassination Carousel.” You should totally submit this! I will have to look into that! Thanks! I think we have a Fancy Nancy book laying around somewhere that we were given before C was born. Now I kind of want to read it and see how good/bad it is! HMy mom LOVED Eloise and Madeline, which of course means I avoided those series like the plague. I mastered the semicolon by avoiding it entirely, despite majoring in English. I started using them in 2012, and was surprised to discover they’re not so bad. My writing style is simple, and rarely requires them. As for Eloise, she’s clearly going to be well prepared for life, as long as life doesn’t require her to do anything. You never know. Her actual goal might be to be one of Janet’s back-up dancers. It’s actually my goal as well, but only if Janet is going through a heavy phase. I don’t need to look all flabby next to her being all svelte. Yay! I love it too. 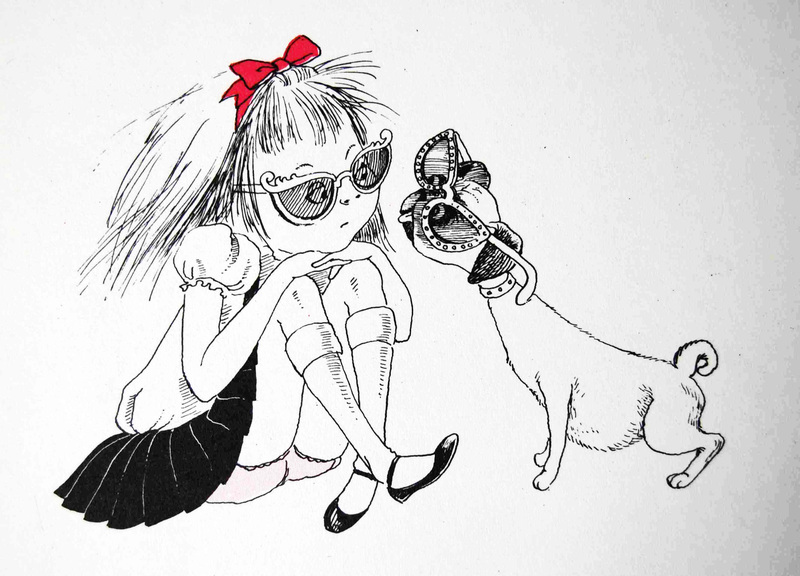 I want to be Eloise. I so love this post! You have quite the talent! ← Cover letters are also not so fun.